Yesterday, I took a nap after a Screwdriver and woke up at 4 in the morning to see Elisia off at the airport. She should have landed by now. Perrine and James were there as well. I arrived in a cab (that drove at 110km/h) just after the family was done checking in. So we settled at a cafe, had some drinks and talked till it was time for them to board their plane. As we parted ways when they entered the transit area, I felt this familiar stab of pain in my chest. It took quite a lot of will power to push those tears back to where they came from. I guess it is a bit silly to cry over this goodbye. Man, I don’t know which to be more stunned at: the fact that blood splurted when The Man poked or when no blood came out at all. No, that was not acupuncture. It was some method of poking needles to let the blood flow out or something since it was a blood clot and the blood is not flowing (or something like that). The Man (I don’t really know whether to label him as a doctor or physician so let’s stick to “The Man”) probably poked me more than 25 times around my hand and finger and squeezed quite an amount of blood from those holes :? 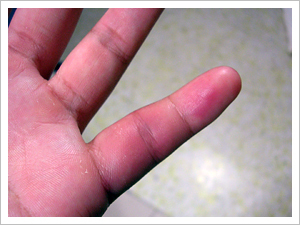 But my left hand felt pretty sore after the whole treatment. 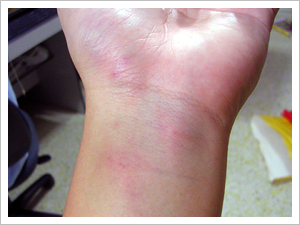 Not to mention the large bruises on the back of my palm and my wrist. The greyish patch at the back of the palm is actually a large bruise. Another large bruise at the wrist. Your finger looks like it hurts quite a lot. It’s a good thing that during the process you didn’t hurt. Hopefully it will go away quickly. Good luck. OMG!!! that’s freaky disgusting…i think u poked more needles this time round compared to the needles i’ve poked throughout my life =x…i dunno what to say…it’s reALLLY OMG~!!!! its not silly to cry over a goodbye. it is the most touching thing.. especially for those who left. haha.. i think it was acupuncture. the man was speakling in chinese afterall. You should have cried over the goodbye! It’s not silly to cry about it. Especially if you’re not going to see them in a long time. 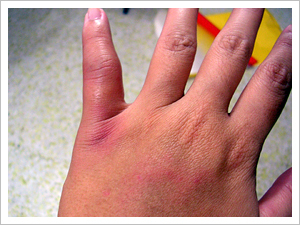 Ouchie, your hand looks horrible, but I hope you get well soon! Whoa…I think you better worry about your finger. It’s been quite some time and still not that healed. I’m worrying about a blister on my heel. Hasn’t healed much…very scared later got infection then will leave a scar. The scab that’s formed is not the usual…it’s more like dried pus? A bit of the skin surrounding the wound is kinda reddish and it’s a little pain when I press it. It’s like the wound I had on my hand. Why in the world are you doing that to your hand?.. I am mightly confused! Looks too painful to even be anything but evil! Well, not good anyway! Omg, that looks like it hurts. Make sure you put some ice on that hand girl, and take care of it! On my blog you mentioned ‘manga’ what is that? OMG! Those are some scary bruises!!!! =( I hope they’ve healed by now! Ouchhh. Those are some deep bruises! =[ I hope you heal soon! Ouch sounds really painful! I would’ve been doing all the wincing and everything too if I was there watching you. That’s amazing that you could tolerate the pain and managed to stay calm through it all! Ok, so what was this needle-poking thing for exactly? I must’ve missed it..
You know, I’ve never really heard of anything like that in my life. Poking you to get your blood to flow? It seems rather strange, but if it works, then I guess that’s what matters. You are looking a bit swollen there.. hopefully that’s all better now? I know what it’s like to get poked all the time because I’m diabetic. It’s a pain, literally. Anyways, that whole process just seems really odd, and I have no idea why in the world you’d let someone poke you like that.. I hope that everything is ok with the swelling and everything though.